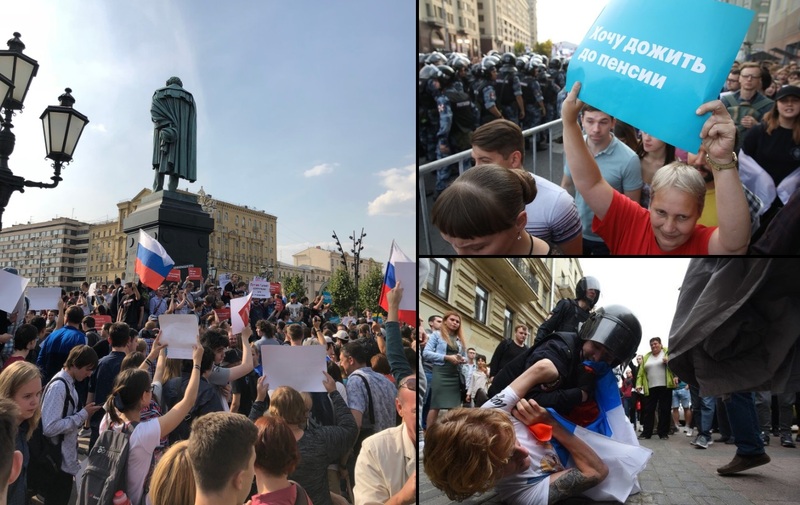 Russia - Election Day Overshadowed By Navalny's Pension Protests, "More Than 1,000 Detained"
Sunday was a tumultuous day for Russia with both regional elections taking place and anti-Kremlin demonstrators protesting the government's plan to raise the retirement age. The protests brought about intense confrontations with police leading to over 1,000 demonstrators being detained. While thousands of citizens headed to their local ballots, thousands more hit the streets in protest of government pension reforms. Elections taking place in 22 regions were contrasted by the protests organized by opposition leader Alexei Navalny who is against the unpopular pension reforms proposed by the government. Demonstrators of all ages at Pushkin Square in central Moscow chanted "Putin is a thief" and "Russia without Putin." Even Russia's youth participated in the protests against the pension reforms with some holding signs that said, "These aren’t reforms, this is robbery" and "Billionaires are robbing pensioners." Low voter turnout is being attributed to the protests and clashes with police with turnout reported to be at 28 percent just two hours before polls closed. The protests were planned nearly a month ago by Navalny who is currently sitting in jail serving a 30-day sentence for his roll in the street rallies. The elections included a vote on executive-branch heads in 21 of Russia's 85 administrative branches. The decision to hold elections was the first major test by the government led by President Vladimir Putin and Prime Minister Dmitry Medvedev. The proposed pension changes would increase the retirement age for men from 60 to 65 and from 55 to 63 for women. Putin later altered the proposal to make women's retirement age 60. The Levada Center polling agency conducted a poll that found more than 50 percent of Russians say they would participate in protests against the age increases. The Russian people feel so strongly about the proposal they were willing to face beatings at the hands of police. One such violent encounter was captured on video. Pensioners say they are worried for their children, and their children say they are worried they themselves wouldn't make it to the retirement age. Many teens are in agreement and fear for both theirs and their parents' futures. The Russia Interior Ministry estimates put the number of protesters at around 2,000, but video and photo seem to show a much larger turnout. A 55-year-old artist named Ivan Karamyan said, "They are going into our pockets and stealing our money. And this is not money that will go back into social services, it will be used for their wars." The plans to raise the retirement ages were first announced in June causing Putin's ratings to plummet. The reaction has been so strong that the Russian president offered a compromise at the end of August but the move has done little to quell the momentum of the protests. Last weekend in Moscow saw around 10,000 protesters gather at a sanctioned Communist Party demonstration. The protests on Sunday were not sanctioned for the most part, including the one in Moscow. A police watchdog group called OVD-Info said that at least 50 of Navalny's supporters had been detained with another 31 being detained Sunday including some of Navalny's closest supporters. Navalny has been a strong opposition leader ever since he ran for mayor of Moscow in 2013. This year's mayoral election is expected to be won by Sergei Sobyanin who ran against Navalny five years ago. A state-run pollster called VTsIOM said the incumbent is an ally of President Putin and expected to collect around 70 percent of the vote. Yekaterina Schulmann, a political analyst said, "These are largely elections in which people don’t see a reason to vote. They don’t see the point." VTsIOM's own polls seem to agree with Schulmann's predictions with the pollster predicting a mere 31.8 percent turnout. Not all of Russia's younger generations are so eager to be politically active. Just a few yards from a polling station, two young women were walking their dog and eating ice cream. Both young ladies said they would rather enjoy one of the years last warm days than vote in a "meaningless" election. One 29-year-old woman named Anna Musina works as an investment analyst for a venture capital firm and said, "We don’t have fair elections, so we don’t have a chance to make a difference." The Russian government tried to combat the abysmal perceptions of the elections by creating a festival-like atmosphere at polling stations where pop music was played on loudspeakers and amusements were available for children such as face-painting and judo-wrestling competitions. The mock festivities were also accompanied by a heavy police presence. Those in Moscow who were just passing through or were tourists were caught in between the protesters and police who set up barricades around Manezhnaya Square next to the Kremlin. Some protesters tried their luck at breaking through the police lines but they were quickly met with batons and violent arrests. The clashes with police lines prompted some demonstrators to throw projectiles at police such as glass bottles. One 65-year-old doctor named Yevgeny Tyurin was out protesting in the streets and feels that violence, not voting is going to be what it takes to fix what he called a "rigged" system. Tyurin said, "If our system changes, it won’t be through reforms but through a bloody revolution. That’s the only way."